Life at 2Hopkins apartments in Baltimore just got a whole lot better. If you weren’t sold on all of our amenities already, we’ve got some pretty awesome news. Our 21st floor amenities have been completed and the possibilities for fitness, fun and more are endless at your 2Hopkins apartment in Baltimore. 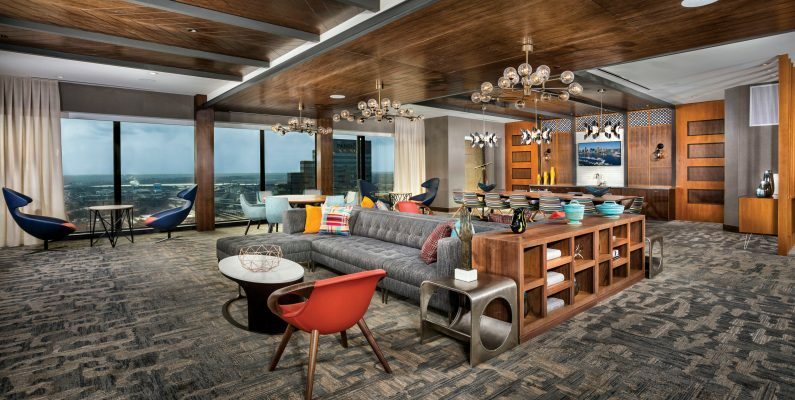 With equal parts plush and luxurious mid-century modern fixtures, get swept up in the world of “Mad Men” while entertaining in our 60’s-inspired clubroom. Make yourself a cocktail at our sleek wet bar and sink into one of our restaurant-style leather booths. Watch the game, read a book or simply enjoy the stunning views of Baltimore while gazing out of the floor-to-ceiling windows. Enjoy Wi-Fi connection and work on a weekday or host an unforgettable gathering with friends. The choice is yours! Not only do our 21st floor amenities offer amazing entertaining space, they also come complete with the best fitness center of any Baltimore apartment. Are you more of a workout class person? Check out our designated yoga/spin room and try an on-demand class that’s sure to get your heart rate going! From luxe entertaining and relaxation space to the highest quality fitness options, the 21st floor amenities are jam-packed with everything a future 2Hopkins apartment renter will need for fitness and fun! Take a tour today and see for yourself!